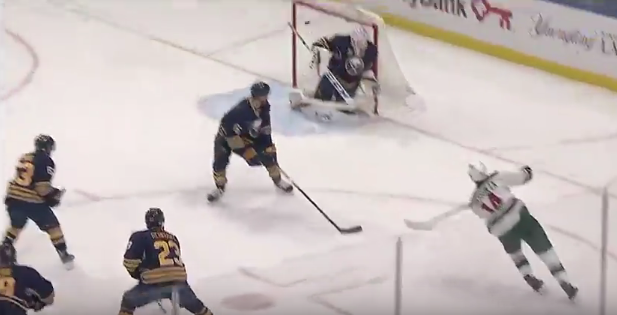 Anders Nilsson’s second game in a Sabres uniform wasn’t nearly as impressive as his first. As the Sabres slept-walked through the first period against Minnesota, ultimately falling 4-0. Nilsson’s performance included a pair of rough goals on Minnesota’s first and third tallies and only 18 saves. He wasn’t under nearly as much pressure as he faced against Philadelphia and he was ultimately victimized on a two goals that beat him as he was down a touch early on outside shots. Minnesota’s first goal, scored by Joel Eriksson-Ek was perhaps the more egregious of the two in question. 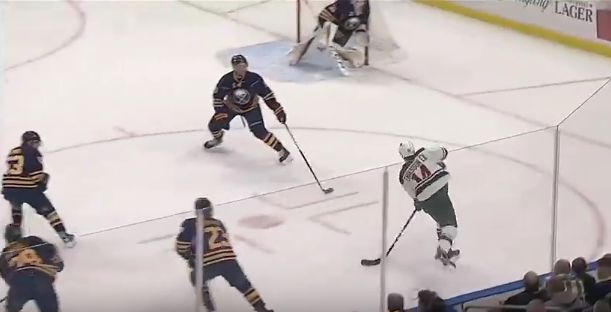 The third Wild goal, off the stick of Ryan Suter found its way through a screen. Nilsson could have played the shot better – and given the score it was certainly a shot that needed to be stopped – but it wasn’t a terrible goal either. Eriksson-Ek’s goal, however, was one that would likely be otherwise stopped. The play developed in a strange way as Jake McCabe was caught flat-footed, allowing Eriksson-Ek room down the wing. Sam Reinhart did a good job forcing Eriksson-Ek into a tight spot near the blueline, where McCabe could close him off and end the play. McCabe, prior to stepping on Eriksson-Ek appears to be in good position, but at some point he gets caught, perhaps underestimating the speed of the attacking winger. At this point, Eriksson-Ek has an open lane to threaten goal, despite not having any help breaking in down the slot or the opposite wing. Cody Franson does well to push to the left to eliminate Eriksson-Ek’s ability to cut to the slot for a better scoring opportunity. With additional help from Zemgus Girgensons there’s even more help for the Sabres, even as McCabe is beat near the blue line. 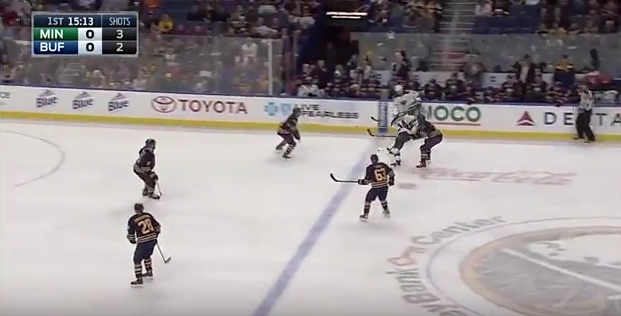 Where Nilsson goes wrong is dropping to reverse vertical horizontal (RVH) too early. It’s a good technique to use when the puck is well below the dots and outside of the slot. By beginning his drop this early he opens the top of the net, particularly blocker side. As he drops, Eriksson-Ek is already shooting as there was already a fair bit of net to shoot at prior to the frame above. 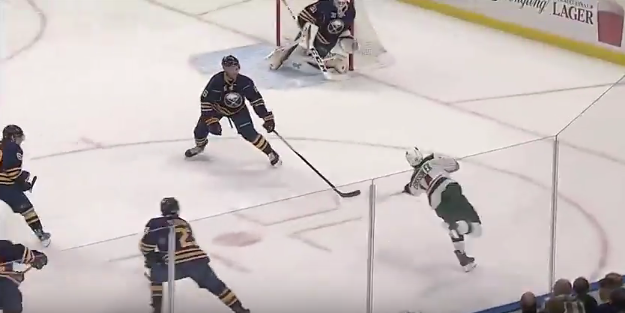 As Nilsson continues to drop to his left knee, he’s doing himself no favors as he’s actually moving the bulk of his body away from the puck. Credit where it’s due to Eriksson-Ek for placing a perfect shot on the far side of the net, from a poor angle. But this is a case where Nilsson trusted RVH a bit too much and got into that position too soon. Had he simply stood his ground in his stance it’s a simple save. Instead, he drops too soon, likely expecting Eriksson-Ek to continue into the corner, and ultimately gives up a goal he will regret allowing so early in a game. One issue that remains for the Sabres has little to do with the goaltenders. Buffalo’s has scored in fits and starts and in games when they needed their offense to contribute, the forwards were a no-shows. Clearly this has a lot to do with the absence of Jack Eichel and Evander Kane but there certainly is a shortfall when it comes to offensive talent on the Larsson and Grant lines. I’ll be interested to see if Tim Murray pushes some roster changes through, recalling players scoring for Rochester such as Justin Bailey. 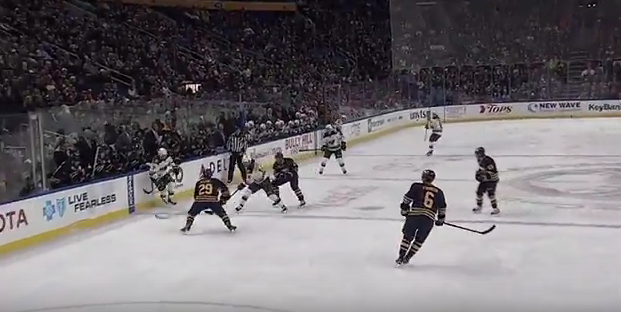 The season is slowly slipping away from the Sabres and while goals like this one aren’t helping the cause, the lack of consistent offense is equally, if not more concerning.